Use texture fills for slide backgrounds in PowerPoint 2010 for Windows. When you want to format your slide background to look different than the readymade styles available in PowerPoint, you can certainly explore both options we have already covered in separate tutorials: solid or gradient filled slide backgrounds. In addition, you could also choose a picture or Texture Fill for your slide backgrounds. Note that both picture or Texture Fills work very similarly, but choosing one option over the other can make the same background look so different. While a picture background results in your slide using a single picture as a backdrop, using a texture background can result in the same picture being tiled across the slide background. Also some pictures lend themselves better to being used as textures, especially if they are seamless. 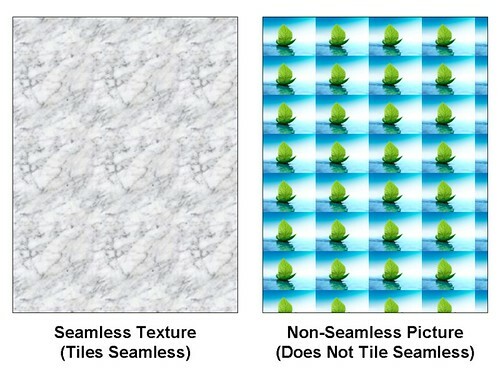 Look at Figure 1 below, note that while both samples show Texture Fills tiled up, the sample on the left uses a seamless texture that tricks the human eye into seeing a single expanse. The texture on the right however does not tile up well and you can see seams everytime the picture tiles up. We have explored picture slide backgrounds (one picture filling the entire slide background) in our Picture Fills for Slide Backgrounds in PowerPoint 2010 tutorial, on this page you will learn how you can add a Texture Fill for your slide background. We assume you have a new presentation created, or you have opened any of your existing presentations. We also assume that you have summoned the Format Background dialog box, as explained in our Format Slide Background in PowerPoint 2010 tutorial. Alternatively, just right-click in an empty area of your slide and choose the Format Background option in the resultant contextual menu to bring up the same dialog box. Within the Format Background dialog box, make sure that the Fill panel is active in the sidebar. Then, select the Picture or texture fill radio button, as shown highlighted in red in Figure 2. Also make sure that the Tile picture as texture check-box (marked as C in Figure 2) is selected, deselecting this option will result in your slide background using a picture fill rather than a Texture Fill. As soon as the Picture or Texture Fill radio button is selected, you can see a Live Preview of your active slide in the open presentation changes to a default Texture Fill. Click the down-arrow located in this area to bring up the Texture drop-down gallery, as shown in Figure 3. Choose from any of these readymade textures to change the slide background of your slide. Note that any of the textures you see in this gallery are seamless, this means that they tile up on your slide background repeatedly without exposing any seams to form a continuous pattern. i. File: This option can be used if you want to use any other picture as a texture. Remember that a texture in simple terms is any picture that tiles repeatedly on your slide background. If you want a library of seamless textures, we recommend Ppted.com's Background Texture Collection. Clicking the File button brings up the Insert Picture dialog box that you can see in Figure 4. Navigate to where you have some textures saved, and click the Insert button in the dialog box. ii. Clipboard: This option fills the background with the content of the Clipboard. If nothing is copied to the Clipboard, this button will be grayed out. When selected, this check-box ensures that your selected graphic is used as a texture rather than a picture. This also brings up the Tiling options that let you to further edit the tiling pattern, we explain this next. These options show up in the Format Background dialog box only when the Tile picture as texture check-box is selected. These options are explained in the Tiling Options tutorial, do note though that the linked tutorial relates to shape fills, but those options work in the same way for slide background fills. This option is used to control the transparency level of the texture you choose as a slide background fill. You can use either the slider or directly type in the required transparency value. i. The Close button to fill selected slides in the presentation with the Texture Fill. If you don't have multiple slides selected, the Texture Fill will be applied to the active slide only. ii. The Apply to All button to fill all slides in the presentation with the Texture Fill. More details about the Close and Apply to All buttons can be found in our Format Slide Background in PowerPoint 2010 tutorial. In Figure 6 you can see the slide background of the entire presentation filled with a texture.